Any material handling salesperson worth his salt can smell an equipment justification a mile away. There are some very basic elements of a return on investment analysis which, when combined, add up to an (almost) immediate sale of a material handling system. A salesperson needs to develop a knack for identifying a prime candidate by spotting the somewhat obvious signs. Whenever I spot the “three amigos” of the material handling world- a crowded plant floor, a multiple shift operation, and a process that I know is mechanizable- my brain’s left side begins a frenzy of “imagineering”. I have had a great number of initial customer visits go extremely well when I play the “what if” game out in front of my potential business partner. I think that they are immediately impressed by my insight and from that point forward I earn the reputation as a problem-solver and a visionary. Experience is the material handling professional’s most valuable asset. Material handling professionals gain the experience part of the equation only after spending a few years in a particular business, studying the marketplace of products available, inviting themselves to see installations (regardless of who sold them) and reading articles in trade publications like this. Now for the “hot” tip I promised. Any time you can apply a piece of equipment to solve more than one task you stand a better chance of achieving your customer’s ROI goals. I have a piece of equipment that can solve two material handling problems for less money than the alternative and the alternative only solves one problem. Does this sound too good to be true? Let me explain. Split case or “less than carton” distribution is considered to be the most difficult of applications to mechanize. The full case distribution center is easily automated with barcode labels, pick-to-belt conveyors, high-speed carton sorters, direct trailer loading and electronic data capture devices. Not so in the split case distribution center. The challenging part of this operation is dealing with individually picked items, located in a (normally) high density storage area, usually without individual item labeling, generally unconveyable and requiring a shipping medium like a carton, requiring a quality control check, resulting in the generation of trash cartons…and the list goes on and on. However difficult this type of picking is, it is a fact of life. Most distribution centers contain split-case product and the requirement to pick this type of order will not go away. Actually, the trend may be to a higher volume of split case items per order as retailers wrestle with shrinking store shelf space and declining inventory levels. It is a royal pain in your customer’s you-know-what. At the same time, it may be your opportunity to be a hero. By knowing the application, the traditional equipment used in mechanizing it, and the application of the overhead chain conveyor system, you can be a hero to your customer and your boss by selling some equipment. Actually, the overhead chain system is only part of a solution involving a few different pieces of equipment. One good solution to the split-case picking problem incorporates a high-density storage device, like a pick “tower” or pick “module”. These modules are usually 3 or 4 levels high for best cubic efficiency. They incorporate flow racking within (or occasionally shelving) and are typically loaded with full carton goods from the perimeter, with the full cartons flowing to the middle for picking. The pick module normally has a gravity/ power/ gravity conveyor located down the middle. Order picking begins with the generation of picking list and a label. An order picker will choose a shipper and affix the label and yes- the shipper is made available to the picker via an overhead chain conveyor located above the triple-wide conveyors running down the middle of the pick module. Operators may add a new carton or tote box from the carrier of the overhead chain conveyor as the need arises, applying the label and beginning to pick. An unfinished order is passed from picker to picker via the gravity conveyor and when the order is complete, the order is pushed to the center, powered conveyor. The completed order moves to a manual or automated checking area and then to the shipping door. As the breaking down of master cartons in the picking aisles occurs, trash corrugate is generated. As master cartons are emptied of their contents, the operator needs to dispose of these without walking too far. Once again, an overhead chain conveyor comes to the rescue. The operator places the empty carton on a special trash carrier (tray) that is attached to the same overhead chain conveyor. Trash carriers and empty carton carriers are mixed in a specific ratio, say 1:4 or so. The overhead chain conveyor carries the trash out of the picking module and over to the hopper of a compactor. An automatic trash dump station is located here and as the carrier is conveyed over the hopper, it is tilted, allowing trash to slide off to the compactor in-feed below. 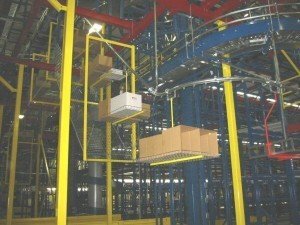 The “dual purpose overhead chain conveyor” is the most cost-effective way to mechanize these tasks. So, learn to spot the signs, study the application and sell high!